In the wake of Steve Jobs’ death, his 2005 Stanford commencement address is getting a lot of airplay. I read it for the first time yesterday, and there are a couple ideas I can’t stop lingering over—how implausibly the dots in his life connected against all human intensions, how his devastating ouster from Apple was the watershed that made the most important things in his life possible, how all the frayed threads wove into a remarkable tapestry. More especially, I am lingering over his comments on death. …for the past 33 years, I have looked in the mirror every morning and asked myself: “If today were the last day of my life, would I want to do what I am about to do today?” And whenever the answer has been “No” for too many days in a row, I know I need to change something. ashram. Merely following whims would leave a young person nowhere. But that would be misunderstanding Jobs. 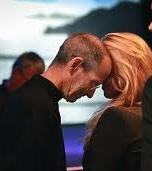 Jobs also spoke of love and passion. He encouraged the young graduates to search their souls for their passion and not to stop until finding it. If one believes passionately in what he is doing, he will persevere in the face of adversity and set aside lower desires for the higher ones. When one looks in the mirror in the morning as if today were her last, her passion would lead her to press on, fighting the good fight to the very end rather than wallowing or resting. I know nothing about Jobs’ marriage except that it lasted over 20 years, and that, too, is an accomplishment reflecting commitment and passion. commentator Alexander Nazaryan commented on the controversial assertion that Americans don’t deserve a Nobel Prize in literature because their work is too interior. They “write from what they know” but lack the life experience of, say, Hemmingway. I’m not necessarily encouraging anyone to fight a war or to move to Paris, but the implication is our soul’s passion can be found in bold life experiences. Jobs was blessed to have found his passion at an early age. It gave him a fast start on what would turn out to be a short life. I have a friend who recently lost her battle with cancer. I wrote to her husband that in another place on Earth or in another time, we would say she lived a full and charmed life. In this time and place, though, her life seems cut short. It occurs to me that we could say the same about Steve Jobs. His accomplishments were many and his passion profound. Join the conversation. How did you find your life’s passion?